While reading Bon Appetit through Flipboard on my ipad, and I stumbled upon an article titled “10 Unexpected Ways to Use Ground Beef.” I immediately thought ground beef was going to be the next greatest item: getting bird doo off cars, filling up holes in walls, curing dog’s bad breathe. I was excited. I’m not sure why I was thinking these things, especially since I knew I was reading Bon Appetit, so to my surprise the article was filled with 10 recipes. 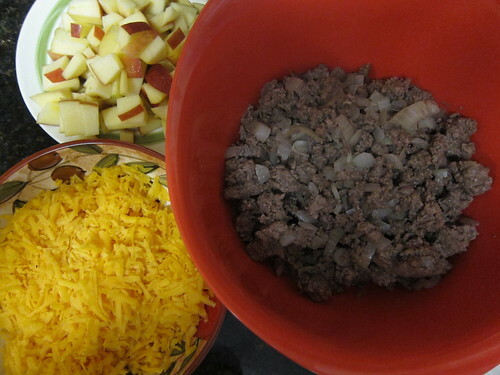 I attempted the third recipe on the list – Apple Cheddar Meat Pies. How could you not want to eat that in fall time? The blurb underneath the picture is all the recipe there is, so I thought easy as pie (hehe). 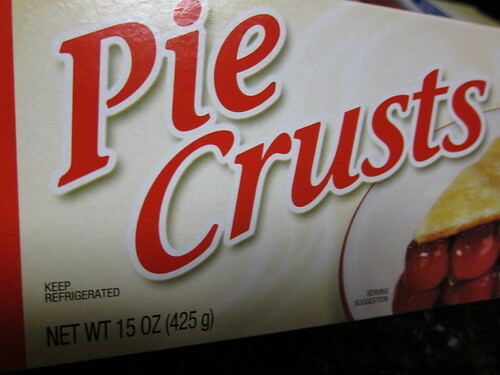 Much against my upbringing (sorry, Mom) I bought pie crusts. Then all I needed was the fillings. I had some help with the cheese grating (1 1/2 blocks of cheddar). 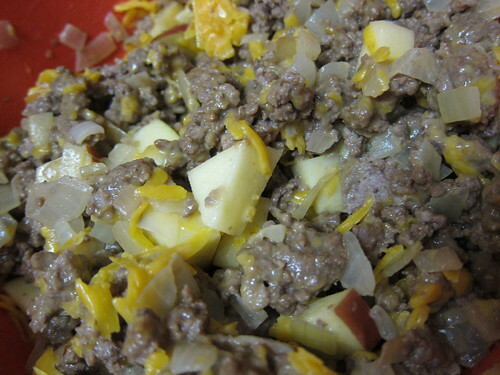 I cut up two apples into small pieces, and cooked an onion with the 2 lbs of ground beef (have I ever mentioned that I’m not good at estimation). Then I mixed up all the filling ingredients. 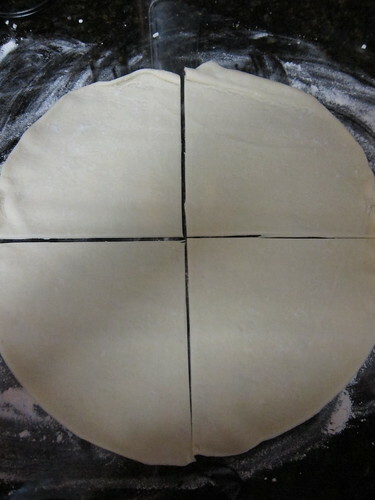 After cleaning and flouring my counter, I laid out a pie crust and cut it into fourths. I put some filling on two of the quarters and used the other two quarters as tops. 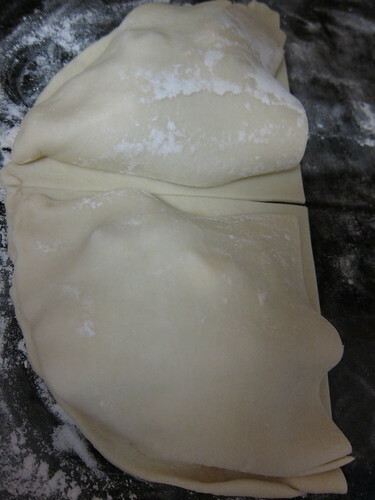 I pinched the edges together, using some water to seal the dough together and then poked the top with a fork. Then I made 8 more pies, and had ingredients for two more but I ran out of steam (and accidentally put water in my filling bowl – not sure why I thought putting it in the sink was a good idea). 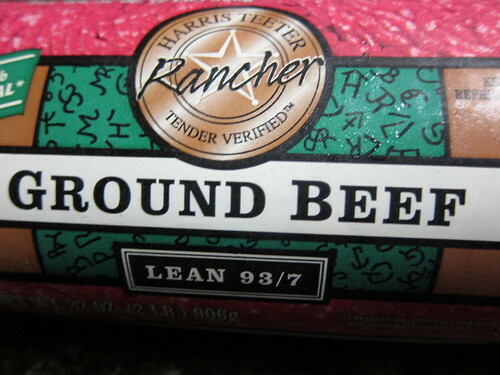 Disclaimer – My meat pies were not that pretty, but I really enjoyed eating them. I especially enjoyed my leftover meat pie for lunch the next day. It was such a satifying meal to perk up my day. I will show pictures, but I know that these did not come out like the original picture. 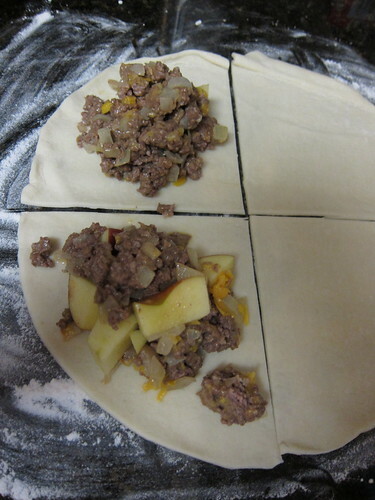 Now I want to make alternate fillings so that I can eat meat pies all the time. I will keep you posted. I agree – Having a meat pie for lunch on Tuesday made my week! I’m so glad I made 10 then. I love making peoples weeks. 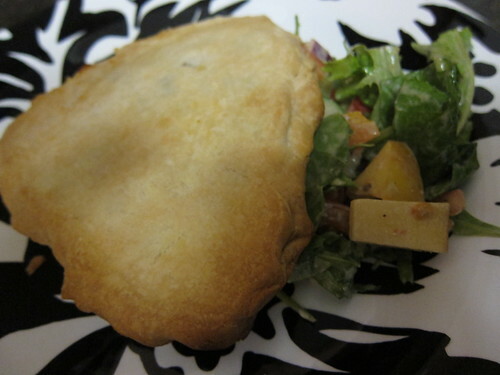 My students were fascinated with my meat pie for lunch – delicious! Why were they fascinated? I feel like most cultures have a dough-filling combination. I’m glad you thought it was delicious though. Oh well, I didn’t teach you well, no home made pie crust. But look what a pro you have become! I would like to clarify that I could make the crust,but I didn’t have time to make the crust. I don’t know if the crust would be a Thanksgiving morning A+ though.